A simple example of this effect is that, when watching the wheels rotate on a horse-drawn cart on television, it appears that the wheels are stationary or even going backwards. This phenomena is brought by the fact that the spokes on the wheels are being rotated at about the same number of revolutions per second as the frames per second of the film being shot. This effect is known as the stroboscopic effect and can also be produced by fluorescent lighting. The discharge across the electrodes is extinguished 100 time per second, producing a flicker effect. This flicker is not normally observable but it can cause the stroboscopic effect, which can be dangerous. For example, if rotating machinery is illuminated from a single source it will appear to have slowed down, changed direction of rotation or even stopped. This is a potentially dangerous situation to any operator of rotating machines in an engineering workshop. However, this stroboscopic effect can be harnessed – for example, to check the speed of a CD player or the speed of a motor vehicle for calibration purposes. By using one of the following methods, the stroboscopic effect can be overcome or reduced. The first maintain light falling on the rotating machine. The fourth makes the effective flicker at a different frequency from the operating frequency of the machines. (i) Tungsten filament lamps can be fitted locally to lathes, pillar-drilling machines etc. this will lessen the effect but will not eliminate it completely. 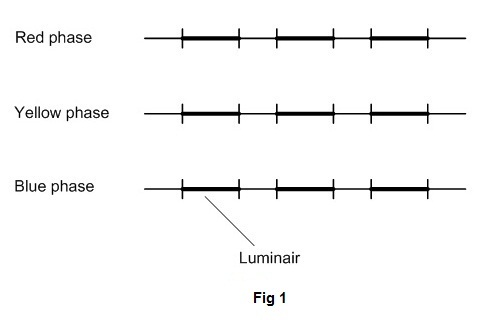 (ii) Adjacent fluorescent fitting can be connected to different phases of the supply. Because in a three-phase supply the phases are 120° out of phase with each other, the light falling on the machine will arrive from two different sources. Each of these will be flickering at a different time and will interfere with each other, reducing the stroboscopic effect. (iii) Twin lamps can be wired on lead-lag circuits, thus counteracting each other. The lead-lag circuit, as the name implies, is a circuit that contains one lamp in which the power factor leads the other – hence the other lags. Using the leading current effect of a capacitor and the lagging current effect of an inductor produces the lead-lag effect. The lagging effect is produced naturally when an inductor is used in the circuit as shown in Figure 1. 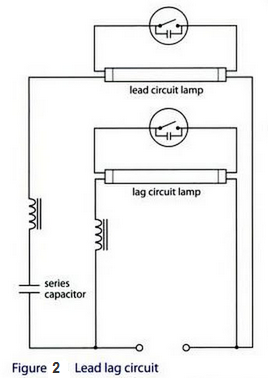 The leading effect uses a series capacitor, which has a greater effect than the inductor on the circuit. When these two circuits are combined as shown there is no need for further power factor correction as one circuit will correct the other. (iv) The use of high-frequency fluorescent lighting reduces the effect by about 60 per cent.